A carefully designed feeding program keeps your hen healthy while producing a maximum amount of eggs. When she's a baby, you'll want to feed her chick starter for the first six weeks of life before switching her to pullet grower for the next 14 weeks to maximize her growth. At 20 weeks, laying crumble provides the nutrients she needs to remain happy and healthy during her egg-laying years. Your hen's protein needs vary during each stage of her life. Formulated foods, such as laying crumble, address the changing needs. In the earliest days of life, she needed 20 to 22 percent protein to help her body keep up with rapid growth, whereas after six weeks she needed only 14 to 16 percent to keep her from becoming obese. Once she's laying eggs, her protein requirement increases again to about 18 percent of her feed to fuel her body for egg development. Laying crumble formulas provide up to 18 percent protein to meet the additional physical requirements of egg laying. Laying mash contains 2.5 to 3.5 percent calcium to help your hen's eggs emerge with strong shells that resist breaking. Regular food for nonlaying chickens contains only 1.2 percent calcium. Laying hens need the extra calcium for their eggs, so their body doesn't leach the mineral from their bones. 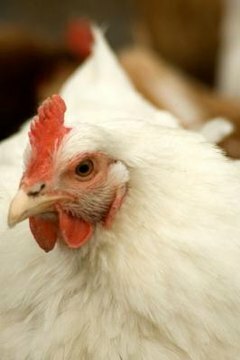 Nonlaying chickens can get kidney disease from eating laying mash over a long period of time. Provide a separate bowl of ground oyster shell or eggshells to let your hens take in a little extra calcium as they feel the need, and your eggs will have strong shells. Inadequate nutrition is one of the primary reasons hens lay infrequently or stop laying altogether. Commercial laying crumble blends a wide range of ingredients for optimal nutrition that would be time-consuming and cost-prohibitive to mix yourself. Grains make up more than half the crumble, with a mixture of corn, wheat, rice, oats, barley and milo. Another 15 percent of the feed comes from high-protein sources such as soybean, sunflower, cottonseed, fish, meat or peanut meal. The remainder of the food provides calcium and minerals through ingredients including alfalfa meal, yeast, salts and vitamin supplements. Layer crumble provides a convenient way to serve your hen a hot meal on a cold day. Simply pour a little warm liquid over the amount your hen eats in a single serving. Use potato water or other water you've cooked your vegetables in, broth, milk or plain water. Whether moistened or dry, crumbles are preferred by chickens over mash because of their larger size, and crumbles have proven to produce the best feed-conversion ratio in studies by Veterinary Medicine International.